Glounthaune: formerly New Glanmire and Queenstown Junction. Many Irish villages have origins lost in the mists of time. But some are very clearly the result of someone’s decision to create a village in a particular spot. This is the case with Glounthaune, located about nine or ten kilometers east of Cork. Until recently all traffic for Midleton, Youghal, Waterford and Rosslare had to go via Glounthaune. However the completion of the dual carriageway from Dunkettle to Midleton put an end to that. Traffic now by-passes Glounthaune, allowing it to slip into a new existence as a very desirable commuter village. Annmount was built by Riggs Falkiner in 1775 but was heavily modified in the 19th century. It burned down accidentally in 1948. The grounds are now filled with a housing estate. The local community have set up a series of sign boards to illustrate and explain the history of the village – which was only created in 1810 by the Falkiner family of Annmount, a local ‘big house’. When I say ‘village’ you must remember that it was a really small place. Firstly, Riggs Falkiner (then MP for Clonakilty, later MP for Castlemartyr) had a quay built in 1780 for the extraction of local stone and importation of coal. 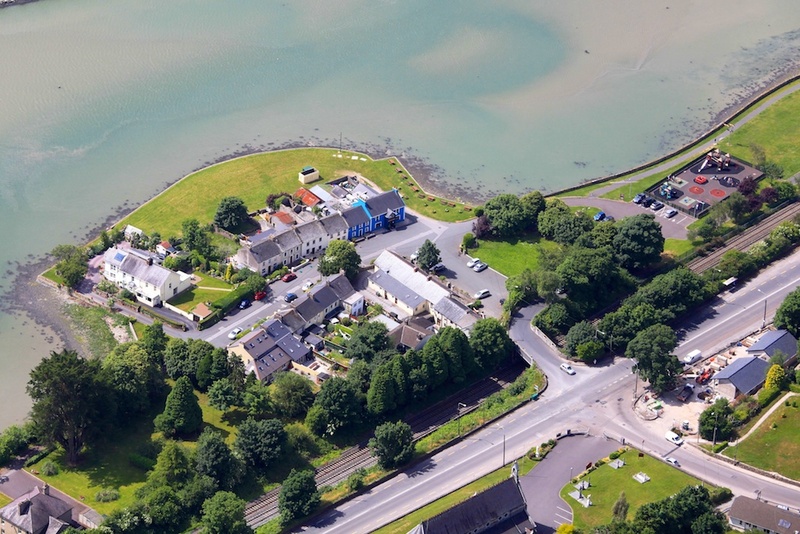 This quay extends some distance out into the waters of the inner reaches of Cork Harbour to ensure that vessels would not ground on the mudbanks. 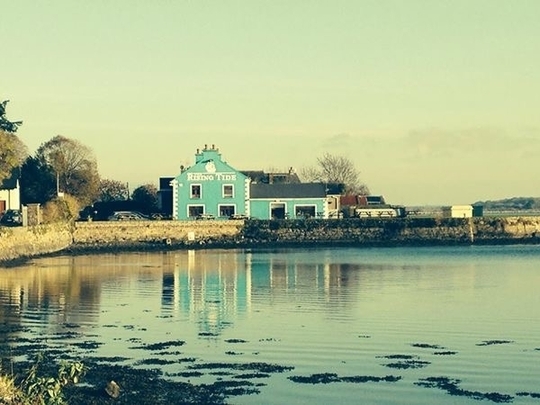 The local parish priest, Fr Murtagh Keane, had a chapel built there in 1803, at a cost of £500 or £600. . A village began to grow up around the quay and the chapel, but in 1819, the local landlord, Sir William Falkiner, had some ‘superior dwellings’ erected in New Glanmire to create a planned village laid out on a T-plan. Sir William’s dwellings were given some of the highest valuations for ordinary houses by th Griffith Valuation – the houses or cottages were valued at £3.10 which was very high compared to the national average of £1. The sea wall at Glounthaune is built of Little Island limestone. This view shows how vulnerable the original village is to rising sea levels. In the 1830s the village got a National School, which by 1837 catered for some 250 pupils. A new school building was erected in the village in 1901, which, happily, is still in use, but as a community center. The current National School is now located on high ground overlooking the village. In the meantime, vast changes had taken place that affected not only the topography of the village, but also its transport links. 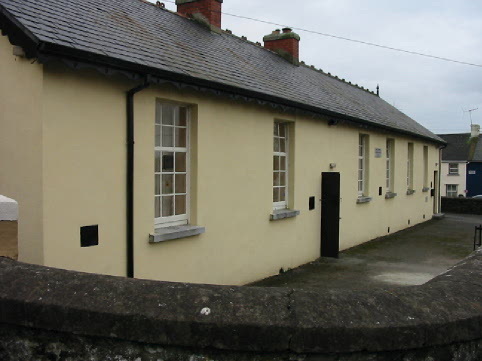 Glounthaune’s former National School was built in 1901. Beautifully preserved, it now serves as the community center. The creation of the village led to the making of a new road on the shoreline to link Cork to Midleton and Youghal. However the only access to this road from Cork was still by way of the bridge in Glanmire. Up to this point the only route to the east from Cork was by boat, as Arthur Young experienced in the 1770s, or via the upper road from Glanmire which ran along the crest of the hills above ‘New Glanmire.’This road passed over what was popularly known as the ‘Dry Bridge’, or Lackenroe Bridge. The bridge was constructed in 1811 by Sir Samuel Falkiner to provide a smooth road from his house at Annemount, overlooking Glounthaune, to Cork on one side and Midleton and Youghal on the other side. The ordinary people at the time didn’t understand the word viaduct, so this bridge was given its popular name. It still stands as one of the most famous fearures of the village. The bridge also allowed the creation of a proper paved road down the steep hill to ‘New Glanmire’, probably replacing an old trackway. The Lackenroe Bridge is still a landmark in Glounthaune, and causes headaches for truck drivers who don’t realize that their trucks might just get caught under the bridge. 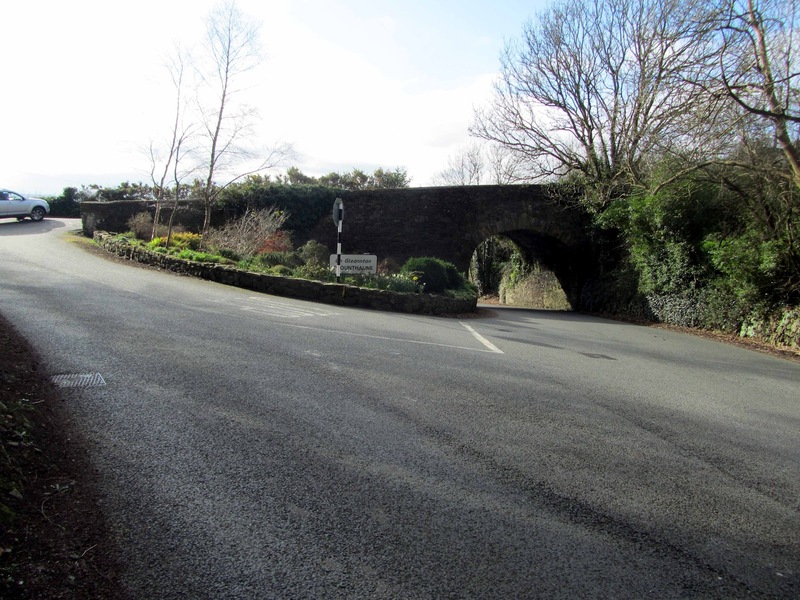 Lackenroe Bridge is a viaduct built in 1811 to carry the old main road from Cork going right to left over the road leading down to the village of ‘New Glanmire’ (on the right). Its popular name was the ‘Dry Bridge’ because it didn’t cross a stream. The most important changes came about in the late 1850s when the Cork to Youghal railway was built along the shoreline. The embankment to carry the track smoothened out the shoreline and created a series of ‘ponds’ on the landward side. The line from Dunkettle to Midleton was completed by 10th November 1859 and reached Youghal by May 1861. By that time the Cork and Youghal Railway Company had been amalgamated with the Great Southern and Western Railway, which proceeded to built the line linking Glounthaune to Queenstown (now Cobh) by 1862. In 1896, the line from Glounthaune to Youghal, vial Carrigtwohill, Midleton and Killeagh was downgraded to a branch line, with the Queenstown line being upgraded to a main line. This was the route that so many Irish emigrants took to meet their passage to North America. Railway halt at Glounthaune was initially called New Glanmire Junction. Then it became Queenstown Junction in 1866, Cobh Junction in 1925 and finally became Glounthaune Station in 1994. With the final closure of the line from Glounthaune to Midleton and Youghal in 1978, Glounthaune became a mere suburban halt on the Cobh line. But the reopening of the rail link with Midleton in 2009 made Glounthaune a busy spot again, since it was now possible to travel by rail from Midleton to Cobh – and Fota Wildlife Park! Sacred Heart Church replaces a chapel built in 1803. The present church opened in 1898 and was designed by George Coppinger Ashlin, who was born in nearby Little Island. One effect of the building of the railway was the demolition of the chapel built in 1803 and its replacement by a new building designed by George Coppinger Ashlin, which was opened in 1898. Ashlin recycled his design for the church at Ballyhooley for the church at Glounthaune, although it seems likely that the parish priest at the time specifically asked for this design. 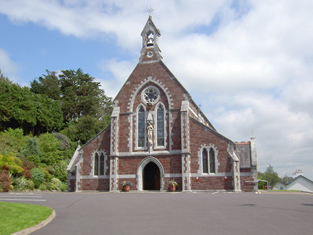 Today, Sacred Heart Church remains the most distinctive monument viewed as one passes the village – for the original village was cut off by the railway line and a bridge was built to link it to the new road on the northern side of the railway. The church stands directly opposite this bridge, close to the site of the original chapel of 1803. 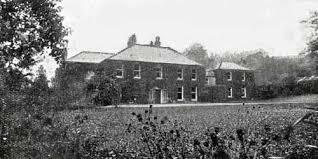 Ashbourne House was the residence of Richard Beamish in the second half of the 19th century. Beamish created the fine gardens with plants and trees from all over the world on the triangular grounds between the Old Cork Road (up the hill) and the New Cork Road running along the waterfront. It was later bought by the Hallinan family, who ran the Avoncore Mills in Midleton. They maintained the gardens into the 20th century, until it was put up for sale. After a few years of lying empty the house was finally bought by the Garde family who turned it into a hotel and proceeded to restore the gardens for the enjoyment of their guests. It is thanks to the Gardes that these gardens were listed for protection. Sadly with the closure and sale of the hotel the gardens have not been maintained to the same standard. One claim to fame that Glounthaune has is the rich planting of specimen trees, especially conifers, from all over the world, but especially from the west coast of North America – at times the place feels like parts of Northern California. These trees and other shrubs were planted by the occupants of the ‘big houses’ such as Annmount and Ashbourne House. 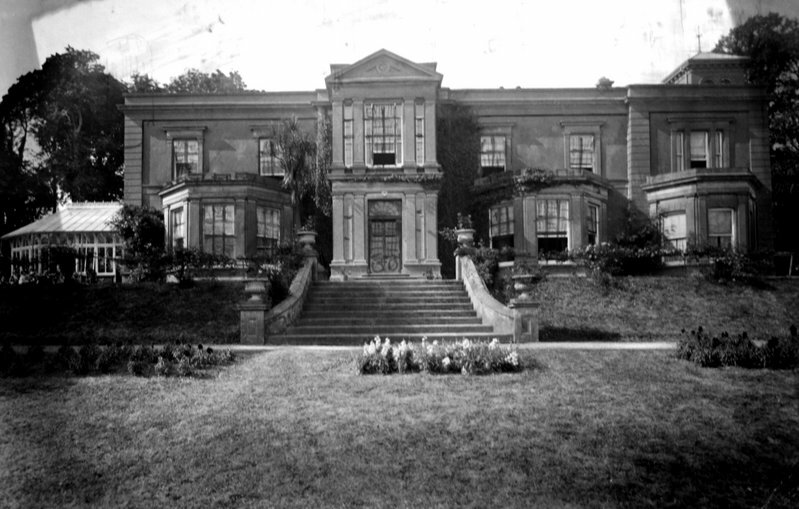 Ashbourne House was the home of Richard Beamish in the late nineteenth century. He used the railway halt directly opposite his house for importing specimen plants for his gardens. (No doubt the denizens of Fota did the same, with their very own railway halt!) Richard Beamish, scion of the brewing family that made up one half of the Cork brewers Beamish and Crawford, was recognized for his contribution to propagating plants when a poppy was named for him – Meconopsis Beamishii. With its sheltered position and sunny southerly aspect, it is no wonder that Glounthaune became a favoured habitat for wonderful specimen plants from the late 1800s. Ashbourne was later acquired by the Hallinan family who ran the Avoncore Mills in Midleton (formerly Hackett’s Distillery). The Hallinans employed some of their mill workers to develop the gardens at Ashbourne – given that their mill was close to the railway in Midleton, it was easy for such workers to get to Ashbourne to work there! The Hallinans kept up the gardens (one would love to know what additions were made by them) but eventually they sold Ashbourne in the 1960s. It appears that the auctioneer removed some of the more valuable plants to Dublin before the sale of the house! The development of the house into a hotel secured its future, with the gardens being carefully maintained throughout these years. Sadly the closure of the hotel in the year 2000 and its current use as an asylum seekers reception center means that the gardens are not properly maintained. The good news is that the grounds are actually listed for protection, so there’s hope for restoring them! 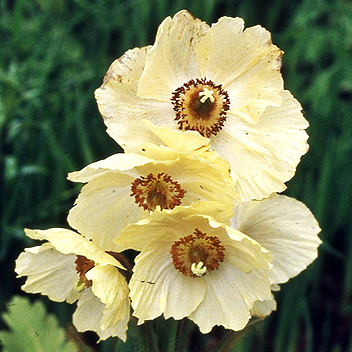 Meconopsis Beamishii – Glounthaune’s ‘national flower’?